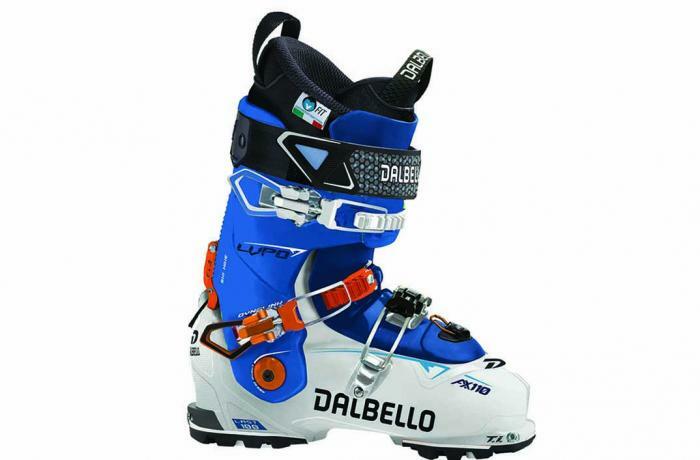 The 2018/2019 Lupo AX 110 W was tested in the women's On-Off Area medium category at Silver Mountain Resort by the experts at America's Best Bootfitters, powered by Masterfit. Packed full of all-terrain and hiking options, the 2019 Dalbello Lupo AX 110 W impressed our test team again this year with its dialed fit, strong flex feel, light weight and touring goodies. It is also one of only two* tech-binding compatible boots on the market that come in a size 21.5, that we're aware of. Testers agreed that the fit is pretty dialed—essentially how a medium width should fit—a little extra room in the toebox, a good snug heel pocket and a comfortably even grip everywhere else. They said the upper cuff's stance is a little upright and the 110 flex rating is for real, so plenty of fore-aft support on tap for charging, if perhaps a little firm against the shin for some. The downhill power-to-weight ratio here was commendable, according to testers who said it tipped and ripped as well as it drove to the front of the shovel, handling all speeds, all terrain and all turn sizes equally well, with no surprises. The hike mode is unique in that to access the boot's full range of touring motion, the tongue must be removed completely using a simple switch at its connection point. With the tongue out of the way, the comfy fabric gusset keeps moisture out and the boot rolls through a massive range. Yeah, you gotta stow the tongue in your pack, but you probably have one if you're slapping on skins, right? The Lupo AX 110 W utilizes two different high grade polyolefin plastics in the lower shell and cuff to shave substantial weight without a reduction of stability. This tech-compatible boot comes with rockered, lugged GripWalk soles for use with backcountry tech bindings or any GripWalk compatible binding, but alpine soles are available as an option.